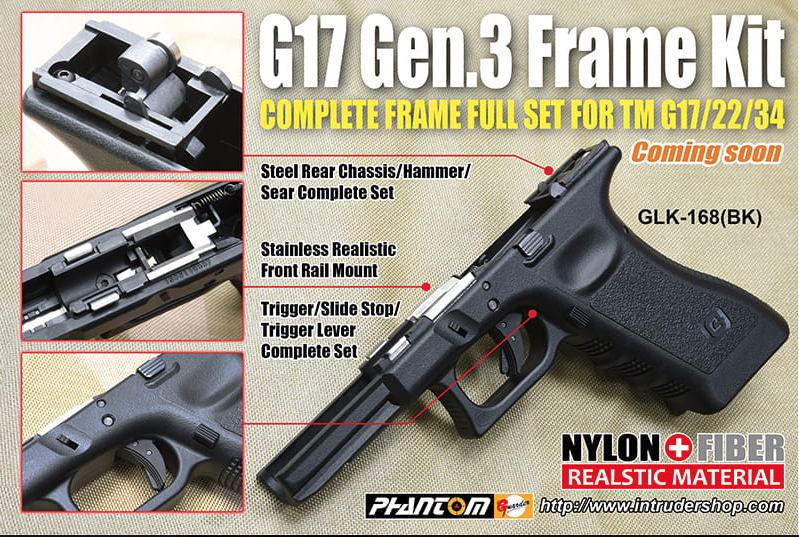 Guarder are doing an updated more realistic/detailed lower frame for TM Glock GEN3 17/22/34. Of course I wish it were for the Glock 19 series but should be coming soon enough hopefully. 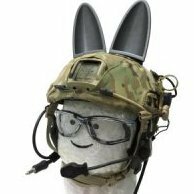 Probably inspired by the realism of VFC but this is obviously a Guarder product. Inner frame look very similar also guarder glock mags look very similar to vfc. I wouldn't be surprised if they share molds at least. Anyhow why another gen 3? We are on gen 5 glock these days. The front rail area is just ultra realistic looking, not necessary VFC-related and it's still Gen 3 TM system, not that I'm complaining, but they already have whole gun worth of upgrade parts in their lineup so it's weird releasing just half the gun. The TM is the most popular and prevalent version of the G series. So many of them out there and so many other brands copy the TM system. I have upgraded a few TM and KJW G17 anf G19/23 pistols over the past couple of years using Guarder parts. Seems I'm always rebuilding something. Depending on the price, I can see myself buying a couple of these and running aluminium slides (steel didnt work great for me-too heavy-big performance drop). Note the "trade" on the grip though. Thats not Glock. Likely Guarder. Such a pointless product really. From a skirmishing point of view no one is going to care what the internal rails look like. They could have made a killing with a correctly traded gen4 frame, like HK3P had. Something tells me the trade on the grip is just for show and to stop cyberscum creaming their pants. They're not going to go to all that effort and ruin it like that. 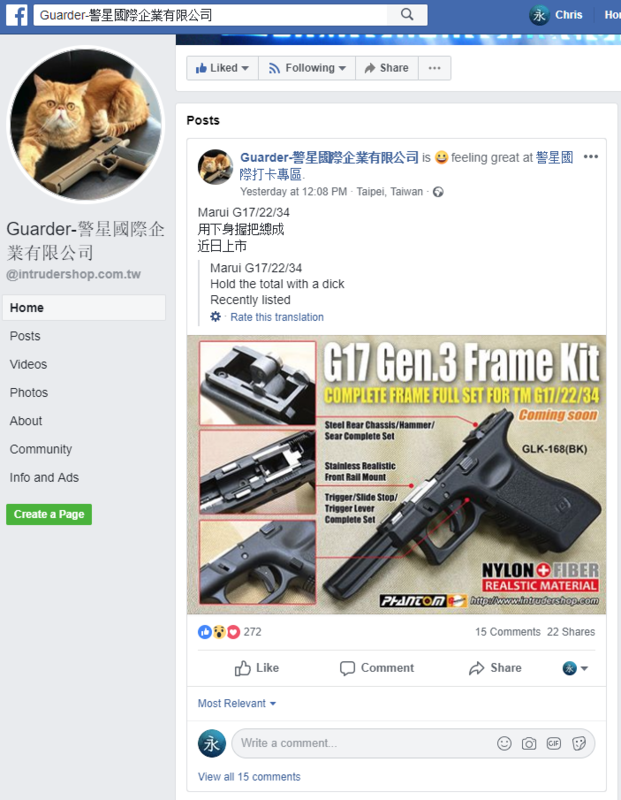 Yeh, all Guarder product pictures either have blank or fake trades now a days but still come with full Glock markings. So just for show. Funny thing is the guarder doesn’t feel anything like the genuine article, having handled one. Having got basically this assembled from the parts available from Guarder individually (albeit with a few Guns Modify parts) I actually quite like the idea of this product. 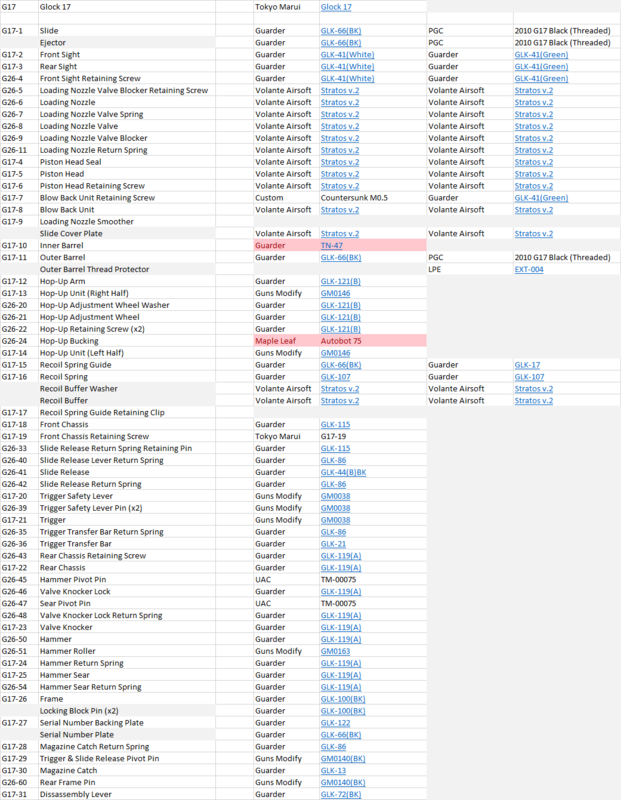 If you're going all-in on a Glock build you're going to be using the majority of these parts anyway (unless you're going mainly Guns Modify, and only using Guarder to make up the difference). If there's a decent cost saving buying them all in one box rather than separately - especially since you otherwise end up having to hunt down parts from 10 different retailers and getting stung for shipping every time - then I think it's a useful product. The biggest saving, of course, is in never needing to buy a donor TM. I bought my Glock used with most of the upgrades already installed, so I don't know the total cost of the gun to its previous owner, but I do know it was built on a TM donor (based on the few remaining TM parts I replaced - the only remaining factory part is #G17-19, the front chassis retaining screw). I would be extremely surprised if the amount he paid for all those parts, even without including the TM donor, was less than double the cost of this complete kit. they already have whole gun worth of upgrade parts in their lineup so it's weird releasing just half the gun. I reckon they figure there's just too many slide/BBU/sight combinations (even just in their own catalogue) to bother trying. Rainbow8 is easier to buy from than KIC since you have to email and get quotes and what not from KIC. Also KICs listed web price of $5250 TWD (~$169 USD) is local for Taiwanese only or direct web site purchases. For international orders they add on a little bit to the price. The front chassis is totally different. Instead of being a steel assembly, it's largely plastic with one bent stamped stainless steel insert (front rails) and one machined stainless steel insert over the trigger pin. The serial number tag is shorter. You can cut a regular Guarder one to size to fit. There's no room under the new front chassis for the TM-style serial plate which engages the safety. The serial number supplied is the Guarder one which appears on most of their slides - if you want to match the TM one, Guns Modify make a serial plate with the TM number. The gun uses a true third pin, not the fake pin ends used by all other frames. This pin retains the spring for the trigger bar, and also adds tension to the slide release spring. All the springs are the same as previous types except the trigger bar spring, which is different and a lot stronger. Both the trigger and third pins are notched, and are a real *bramston pickle* to hammer out. None of the pins in the gun are knurled. The rear of the frame is slightly different. I didn't try to cross-fit the rear chassis but I bet they aren't compatible. Overall parts compatibility with existing Guarder parts is pretty good, except for the trigger bar spring. Triggers etc. are normal, and I reckon zero hammers and the like will probably fit. Overall I'm pretty happy, except for the fact the thing arrived absolutely bone dry. Also the front chassis design is more realistic as the pictures show and you describe so getting rid of the old style full metal/steel chassi isn't really a "bad" thing per say. Except for the weight difference, if anyone cares about that. New frame (with Guns Modify aluminium trigger, but otherwise stock): just under 200g. Old frame: just over 220g. In the hand, with just the frame (no magazine or upper assembly), the difference is quite noticeable because the weight is all concentrated up front.